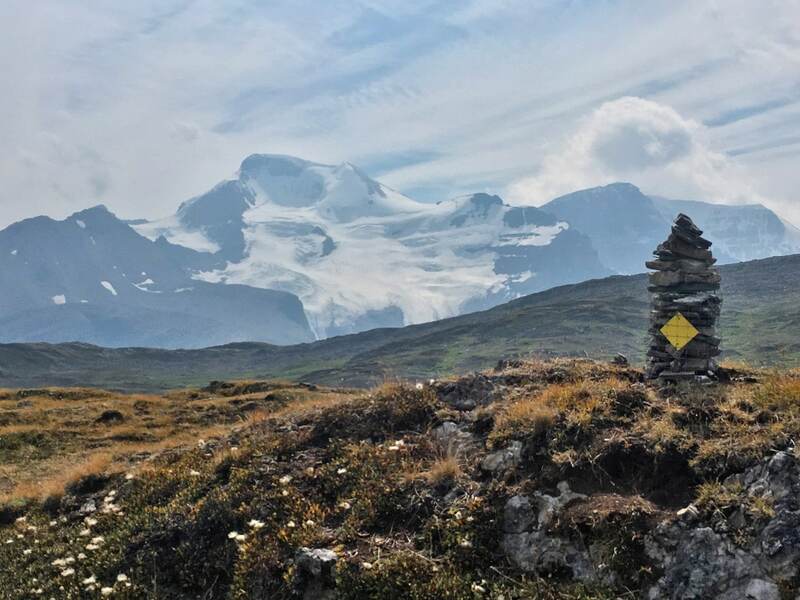 The Wilcox Pass hike offers hikers easy access to alpine meadows as well as incredible views of the peaks and glaciers on the eastern edge of the Columbia Icefield. 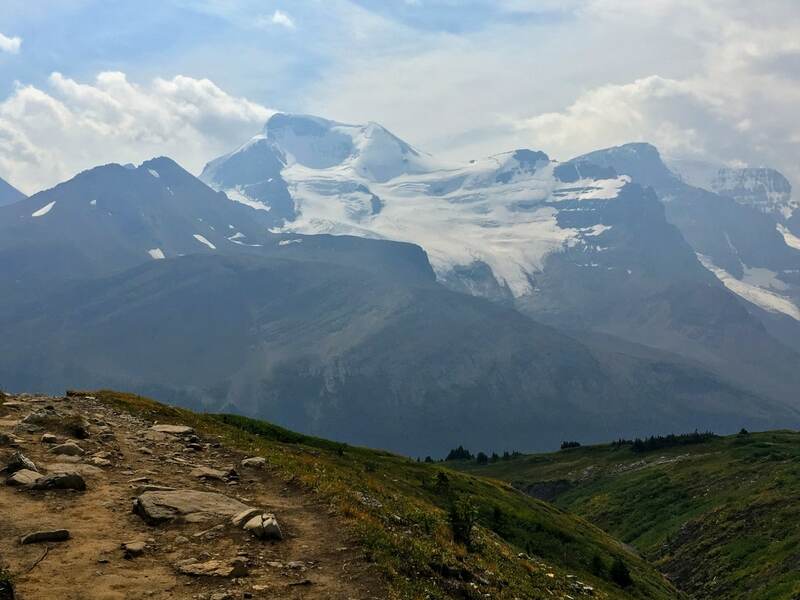 This hike is a must-do when you’re on the Icefields Parkway, and a great trail to enjoy the Athabasca Glacier for free. 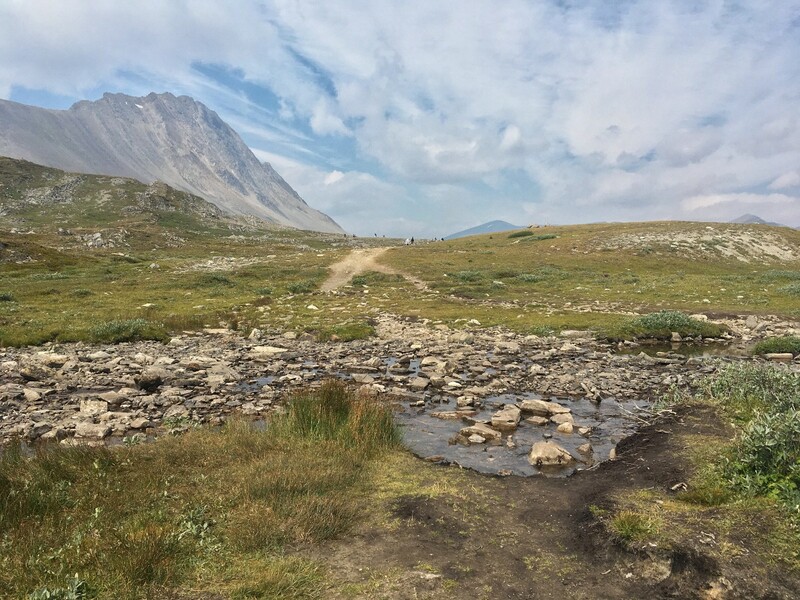 The Wilcox Pass parking lot is 3.0km south of the Icefields Discovery Centre in the Wilcox Creek Campground. Park in the spaces provided, or along the driveway to the campground. The trailhead is on the left, just after you turn off the highway. 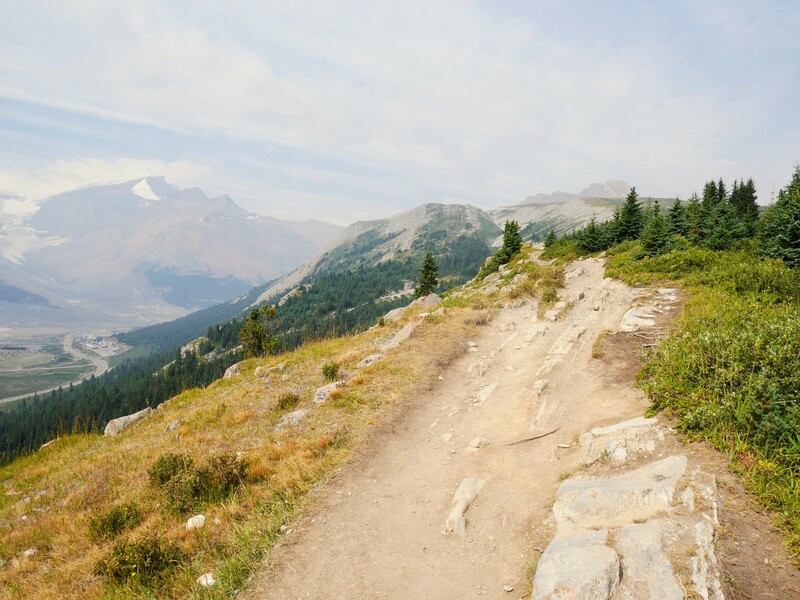 From the Wilcox Pass Information Kiosk, take the wide, well-trodden trail that climbs steeply away from the kiosk. A small wetland & pond sits off to the right a short distance from the trailhead, a protected hamlet for waterfowl. The first part of the trail is badly eroded and full of roots. Delicate twinflower plants dot the sides of the trail. You may find yourself out of breath. 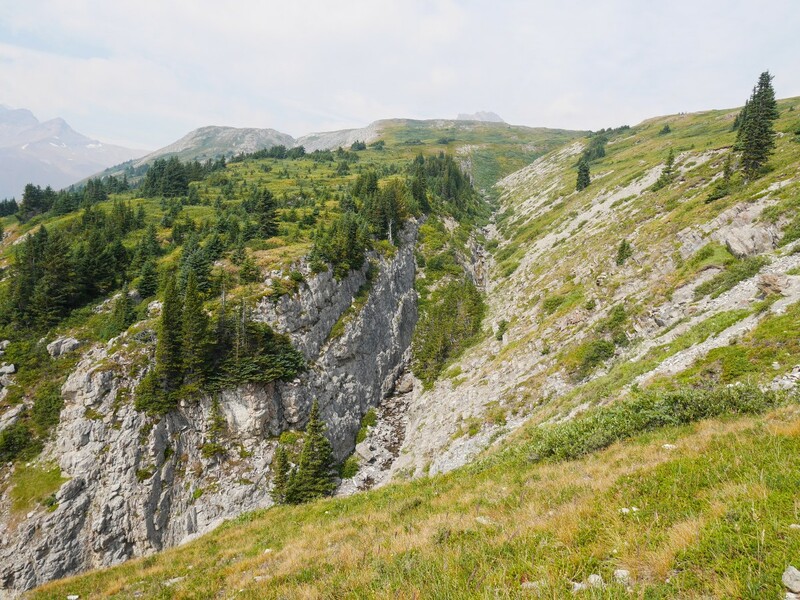 At 2040m, the trail starts higher than most others in the Rockies finish, the thin air makes hiking more challenging. 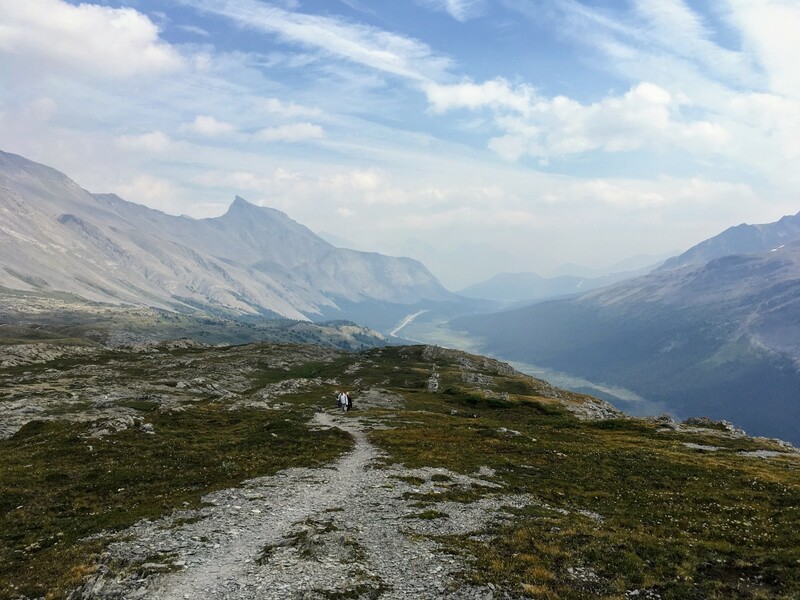 Less than a kilometre along the trail, past a short wooden boardwalk and staircase, you get your first spectacular view over the Sunwapta Pass. 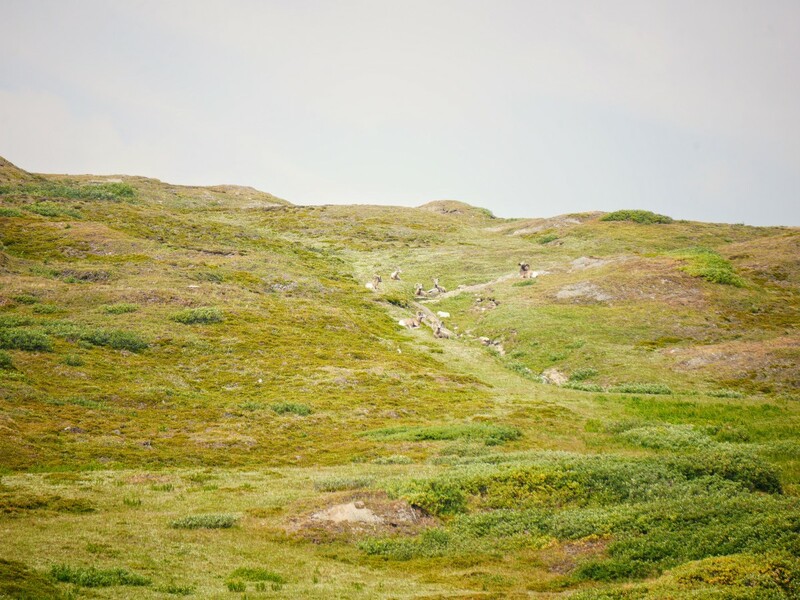 Quickly, you’ll find yourself hiking above the tree line, the trail flattening and continuing along the ridge to a set of Parks Canada’s Red Chairs. These chairs are placed in scenic locations in national parks across Canada, inviting visitors to sit back, relax and enjoy the best views Parks Canada has to offer. High winds whipping off the Columbia Icefield and up the cliffs to this spot mean you won’t be lingering long. Beyond the chairs, hike up a short steep section ascending along the edge of a ravine. Gnarled stands of kruppelholz provide the last bit of tree cover along the route. Various side trails branch off to the left for a better view. Bighorn sheep, particularly rams, frequent the pass, and are often seen on the south-facing slopes opposite the ravine here, enjoying the afternoon sun. Once the trail flattens out, a few other side trails branch off, crossing the creek at the bottom of the ravine. Stay on the obvious main trail. From here you hike another kilometre of easy, straight, and flat trail to the summit of the Wilcox Pass. Mt Athabasca (3491m) and Snow Dome (3456m) dominate the skyline to the west. To the east, much closer, is a long ridge, which is part of Nigel Peak. Near the apex of the pass you rock-hop across a small creek. The pass itself is wide and flat (classic hallmarks of a glacial carved valley). The trail extends past the height of the land, eventually leading to Tangle Falls, but is unmaintained and considered a “wilderness route” past here. More enjoyable is the hike out to Wilcox Ridge. The trail turns sharply left and, marked by large rock cairns, begins a rolling ascent towards Wilcox Ridge. 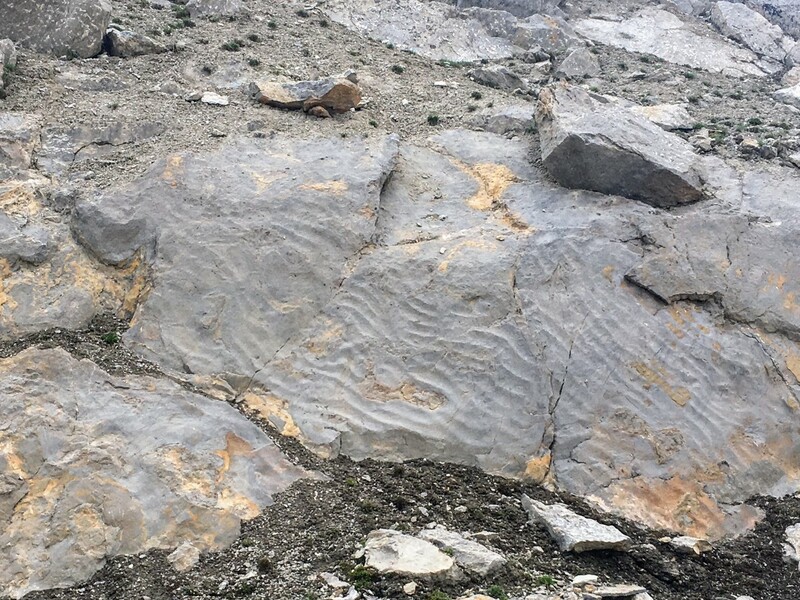 Climb up and down over upturned layers of limestone. Looking up you can follow their lines to the right all the way to the summit of Wilcox Peak (a modest 2884m). A faint scramblers trail can be seen on the slopes of the mountain. Approaching one of the rock layers, you see the ripples of the ancient ocean floor frozen into rock. 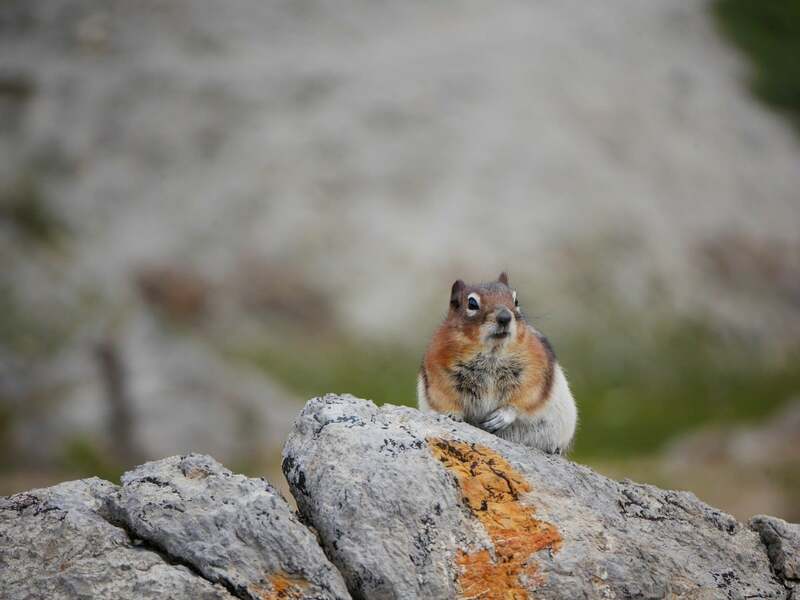 Golden mantled and Columbian ground squirrels call out the danger of your presence in a steady “Eeep! Eeep!” Hardy alpine wildflowers cling to the rocky soil. Look for the cushion-like moss campion, with its minute pink flowers. 1.2km from the pass, a large rock cairn marks the Wilcox Pass lookout. 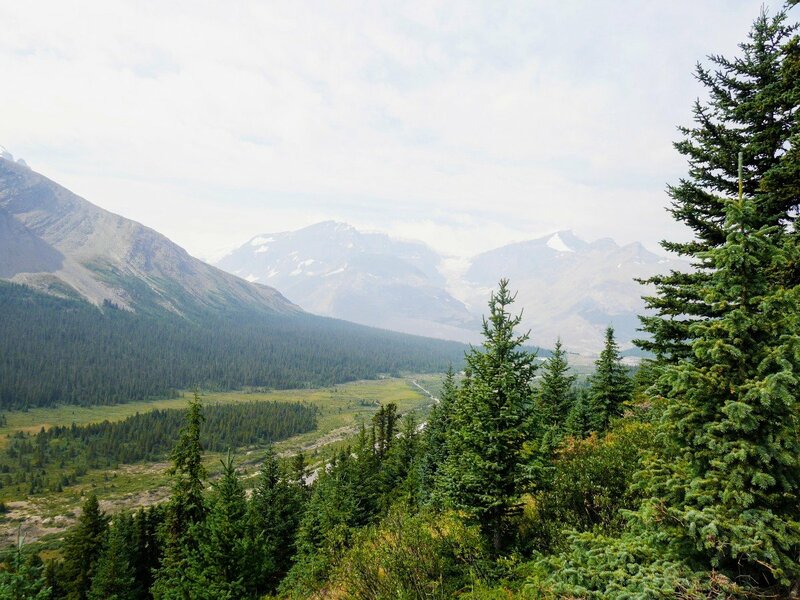 Before you is a 180-degree view of the mountains and glaciers making up the eastern edge of the Columbia Icefield. 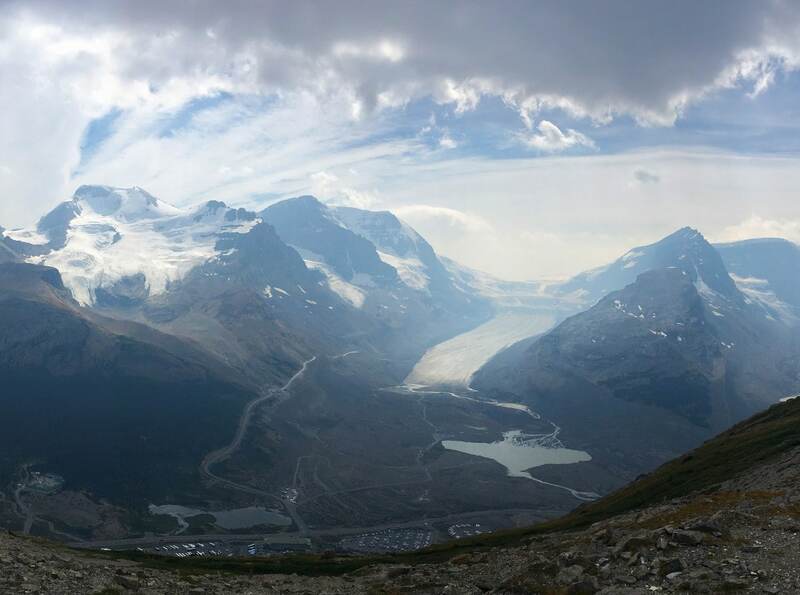 The Athabasca glacier takes centre stage. Look for Brewster’s snow coaches crawling like ants out onto the ice. Below you is the Columbia Icefield Discovery Centre. The Athabasca glacier extended to the back of the parking lot at its largest in 1846. While thousands of cars are parked down below, you’ll share this viewpoint with only a few others. Dome and Little Dome glacier hang from Snow Dome, the hydrologic apex of Canada. Water from the top of this mountain is sent to three different oceans – the Atlantic, Pacific and Arctic.  Cold, katabatic winds coming off the icefield blast you at the viewpoint, but shelter can be easily found on the lee side of one of the rock ridges for a quick snack before you return the way you came. Near the summit of Wilcox Pass there is a slightly elevated pile of rocks. These make an excellent spot for lunch, especially the rock shaped like a sofa. Spend some time looking down. 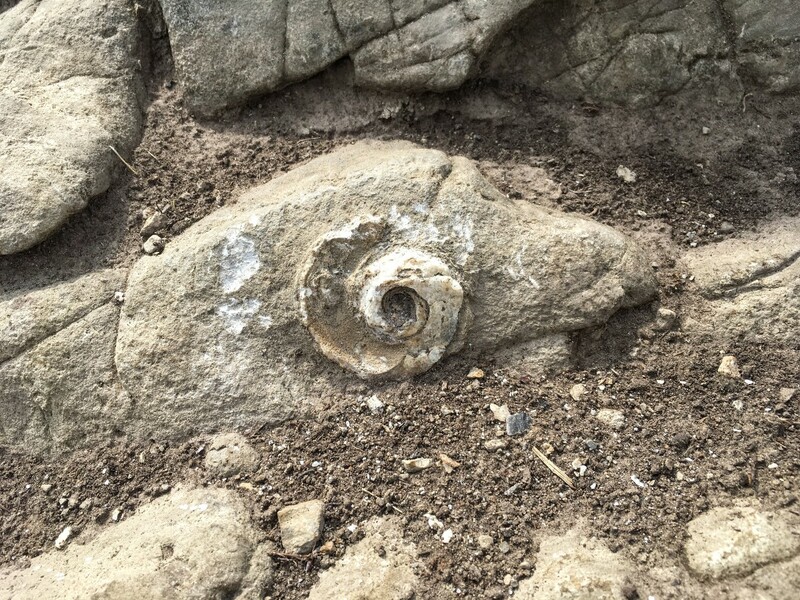 Fossils are embedded in several of the rocks here. Use the washroom before you arrive. There is only one outhouse at the trailhead, which has a near constant line due to the popularity of the trail. People who skip this have to use the trail. If you do so, please don’t leave toilet paper littering the trailside. In 1896, Walter Wilcox and his team became the first westerners to reach Sunwapta Pass. 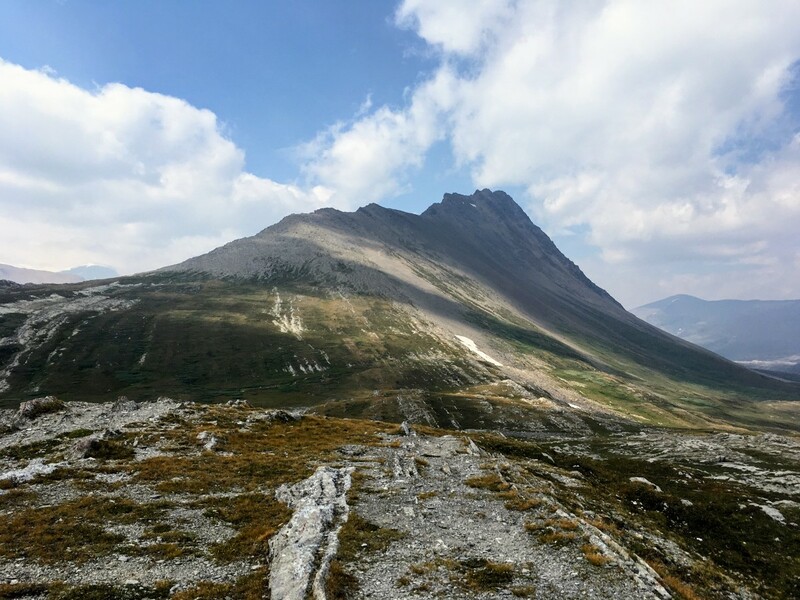 On an expedition to find a pass between the Athabasca & Saskatchewan River, their path was blocked by a gorge, cutting between the toe of the (then unnamed) Athabasca Glacier and Wilcox Peak, they ascended over the high grassy pass to the east instead. The trail follows this original route.